After teasing an announcement all week, Dave Smith Instruments has unveiled a new flagship monophonic synthesizer called the Pro 2. The Pro 2 marks a natural progression of Dave's synth engines, using the digital oscillators and analog filters of the Prophet 12 but using a form factor similar to the Mopho SE. At $1999, the new mono synth isn't cheap, but the incredible list of features justifies the price point. The Pro 2 has a ton of great little features, like paraphonic mode, 32 step sequencing, and control voltage integration. 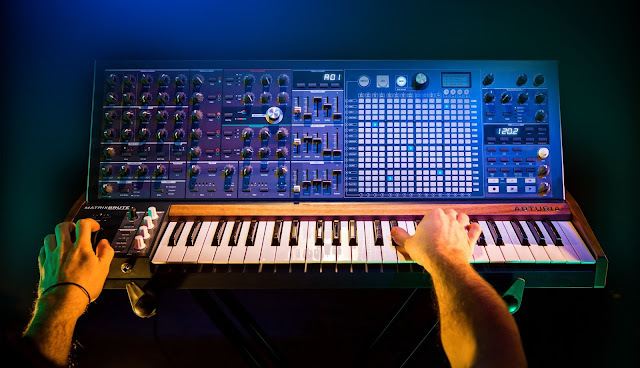 The amount of connectivity and control it offers is astounding, and this looks like it could be THE modern style mono synth, bucking the analog oscillator standard of today in favor of digital, albeit more editable, oscillators. 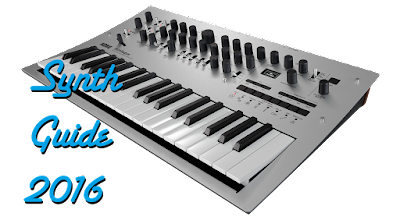 This is a slam dunk for Dave-- the keyboard won't attract the low-price aficionados, but DSI already has multiple synths for those crowds, between the Tetra, Mopho, Mopho Keyboard, and Mopho X4. The sound demos in the video above show how warm and deep it can be. The sheer sonic possibilities could make this a great all-in-one modern mono synth, with full blown connectivity. The only thing that might hold it back is its price-- for just $1000 more, you could get a full on Prophet 12, or for $200 more the Prophet 12 module. Can't wait to hear more. For more information, read on below or check out the official DSI site. The Pro 2 is a fusion of classic analog synthesizer design and cutting-edge digital technology. It boasts four high-resolution digital oscillators, plus a sub oscillator. The oscillators produce both classic and complex wave shapes and can frequency and amplitude modulate each other in any operator and modulator configurations you choose for harmonically-rich FM and AM sounds. A set of Character controls adds high and low frequency boost, bit and sample rate reduction, and tape saturation emulation to the Pro 2's sonic palette. At the heart of the Pro 2's gutsy sound is its all-new dual filter design. Filter 1 is a 4-pole low-pass design inspired by the original Prophet-5 filter. Filter 2 is a state-variable design inspired by the Oberheim SEM and can be continuously varied between low-pass, notch, and high-pass operation, with an optional band-pass mode. The two filters function in either serial or parallel, or anywhere in between. Two of the four oscillators can be routed through Filter 1 with the other two routed through Filter 2 for a broad range of tonal possibilities. One of the most exciting features of the Pro 2 is its sequencer—possibly the most powerful step sequencer ever designed for a synth. With up to 32 steps and 16 tracks, it provides real-time input, rests, and variable-length sequences. It also syncs to MIDI clock and external audio input. Sequence tracks can control any parameter in the Pro 2's extensive modulation matrix. The Pro 2's flexible architecture opens the door to not only processing external audio, but also to interfacing with modular synths through its 4 rear-panel control voltage inputs and outputs and a dedicated gate output. Control voltages can be assigned and routed from within the modulation matrix and can run at audio rates for extreme modulation effects. Some of the many parameters that can be sent to the CV outputs include oscillators, LFOs, envelopes, and sequencer tracks, making the Pro 2 a natural choice for the center of your studio or live setup. The Pro 2 was designed primarily as a super-powerful monosynth, but it’s also a true, four-voice paraphonic synth that allows you to control each of its four oscillators individually with their own envelope. This makes playing four-note chords not only possible, but very expressive. Package all of this power in a three-and-a-half octave, semi-weighted keyboard with velocity and channel aftertouch, add two backlit pitch and mod wheels and two location and pressure sensitive touch sliders, and you've got one of the most feature-rich, awe-inspiring synthesizers ever created. Five high-quality digital effects. Thicken the signal and add harmonics or completely destroy the signal pre-filter. Girth and Air are high and low shelf equalizers with harmonic excitement. Useful for thickening and/or adding air to the signal. Hack and Decimate are sample and bit rate reduction algorithms which can add subtle grit or completely trash the signal. It's harsh yet musical. Filter 1 is a 4-pole resonant analog low-pass filter inspired by the original Prophet-5 filter. Filter 2 is a 2-pole resonant analog state-variable filter inspired by the Oberheim SEM filter and can be continuously varied between low-pass, notch, and high-pass operation, with an optional band-pass mode. Oscillator Split allows oscillators 1 & 2 to be sent to Filter 1 and oscillators 3 & 4 to Filter 2. Three-tap syncable delay with feedback and amount controls, pan, and high-pass and low-pass filtering, all per delay. A separate fourth delay is a digital bucket-brigade delay (BBD) for analog-style effects. Parameters that can be sent to CV outputs include oscillators, LFOs, envelopes, sequencer tracks and any other source within the modulation matrix. Runs up to audio rates. Gate Out for triggering external CV-compatible devices; any CV in can be used as a gate input. Modulation assignment buttons enable quick and easy modulation routing. Mod Matrix runs up to audio rates. Advanced step sequencer provides up to 32 steps per sequence and up to 16 tracks. Sequences can control not only oscillator pitch but any parameter in the modulation matrix. More than 50 knobs and 65 buttons enable deep and comprehensive editing with minimal menu diving. Backlit pitch and mod wheels are easily visible in low-light situations and have a smooth yet precise feel and response.